Updated: You can read about the photos that leaked out on January 22 below, but we have now seen video of the watch in action and you can watch it below. Hikari Calyx on Twitter provided the video look at the watch that shows a similar UI to what we saw on the Microsoft Band. 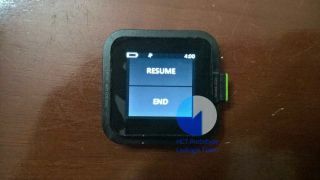 Original story: Microsoft’s odd-but-interesting Xbox Watch unreleased prototype is no stranger to popping up in a leak online, but today, we’ve caught a glimpse of its user interface. The leak is thanks to a Twitter user who appears to have acquired not one, but several, units. If you’re familiar with Microsoft Band, then you'll recognise the tile-based interface that was popularized by Windows 8. Obviously, the Band used a horizontally-oriented display when it was available, differing from the Xbox Watch’s square screen. But what’s on-screen looks remarkably similar, featuring a tile for starting workouts, checking heart rate, timing a run and impressively, appears to pack in GPS. What's not clear is exactly did this watch have going for gamers with it being called the Xbox Watch - so is that why it ended up as the Microsoft Band? Alas, Microsoft has discontinued support for all of its wearables, and though we still can use the Microsoft Band 2, it’s unlikely that the Xbox Watch will ever release. So, why not enjoy a few photos of the unit above, which looks painfully close to being released.